Elizabeth Diller AR'79 and Ricardo Scofidio AR'55, founding partners of Diller Scofidio + Renfro (DS+R), returned to The Cooper Union on February 2 to speak about their latest projects. The firm has designed, among other things, The High Line, The Institute for Contemporary Art building in Boston, the Broad Museum in downtown Los Angeles, and the Culture Shed at the Hudson Yards, currently under construction. They spoke at The Irwin S. Chanin School of Architecture as part of its Lunchtime Lecture series of informal talks by architects in practice, many of whom are alumni of the school, that has been curated by Dean Nader Tehrani to foster discussion and debate about contemporary practice among current faculty and students of the school. Ms. Diller, who taught at the school in the early years of their practice, and Mr. Scofidio, professor emeritus of architecture, presented a selection of DS+R’s work followed by a question-and-answer period in which she and Mr. Scofidio reflected on their career, their thoughts on education, and the ways that representation can inform a project and its audience. The discussion, which extended well past the usual one-hour length of this lunchtime series, was attended by an overflowing audience of students and faculty. Ms. Diller showed a set of images highlighting projects that underscored the firm’s unorthodox vision of what an architectural firm can do. 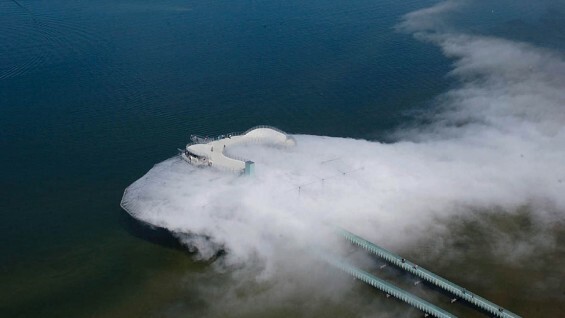 Starting with the Blur Building (2002)—a pavilion immersed in fog to create what Ms. Diller called “a space where there was nothing to see and nothing to do”—she laid out the couple’s determination to create an interdisciplinary practice that has critiqued standard notions of design and conventional curatorial practice. In several exhibitions of their work, for instance, they created what she called “perverse protagonists” to shift the way visitors experienced a space. 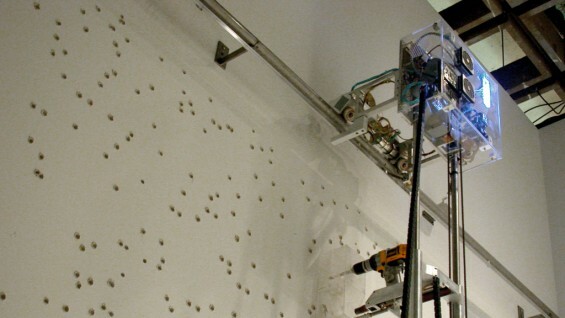 At a retrospective of their work at the Whitney Museum of American Art, for example, they collaborated with Honeybee Robotics to design a drill that regularly made random holes in the exhibition partitions to physically undermine the separation of the exhibition spaces. 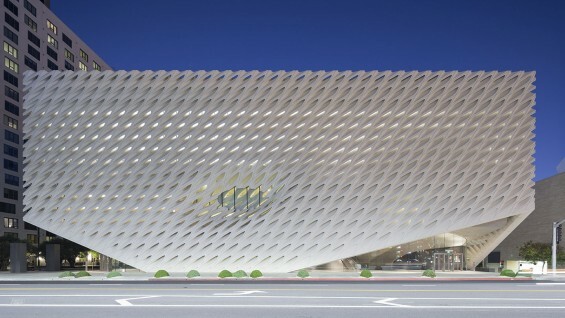 Ms. Diller spent the last part of her talk describing the ideas behind The Broad, LA’s newest museum and “Shed,” an arts venue that will be built at the Hudson Yards. The Shed has a retractable exterior steel shell that can be extended to the eastern part of the site, rolling on custom-made steel wheels. An animated video showed the multiple ways the Culture Shed could be configured to accommodate any number of uses. Mr. Scofidio pointed out that the two never see any site as a tabula rasa; they’re acutely aware of the history and uses of a location when designing. 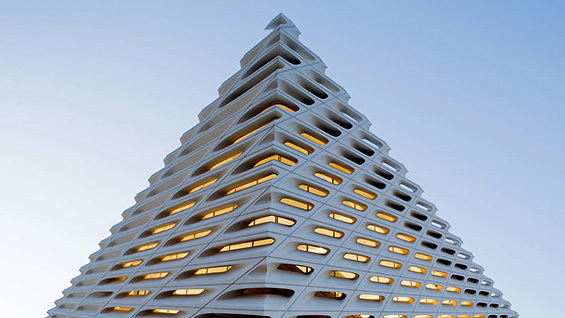 Both of them have felt the need to push against what Ms. Diller called the “hermetic” quality of architecture and reach out to engage multipledisciplines. Alice Colverd, a thesis student working on a project about film and architecture, asked the couple why they chose to show an animation of the Shed as opposed to architectural drawings for an audience of architecture students. Mr. Scofidio and Ms. Diller acknowledged the importance of architectural representation for different purposes. “Drawing a section is about your brain learning about the architecture, not about representation,” Mr. Scofidio said. Ms. Diller added that an architect needs a “big toolkit” whether for representation or for expanding the customary limits put upon architecture.